Mount Alam Koh is located in Kelardasht, Iran. Because of its similarity, elevation and also the good-looking shape, Alam-Kuh was given the nickname as Alpine of Iran. The Height of Alam Mountain is 4850 meters above sea level and it is the second highest summit in Iran after Damavand Mountain 5671 m. Alam Koh is located in Mazandaran province in north of Iran. Alam is a part of Takht e Suleyman Massif in Alborz Mountains. Alam Kuh has many different routes for mount climbing, hiking & trekking, bouldering and ice climbing. 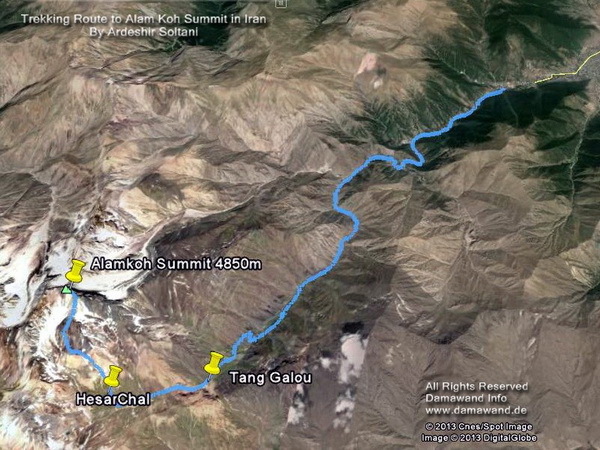 The first maps shows the trail from starting point Vandarbon to Tang Galou and Hesarchal to Alam Koh Peak. 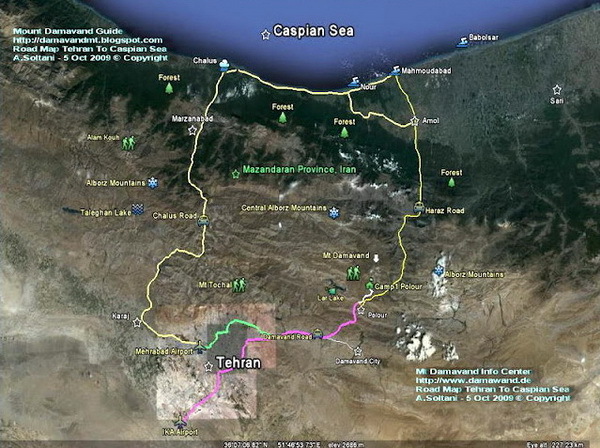 The second map is the road map from Tehran to Chalus and Hraz Roads. Tehran> Karaj> Chalus Road> Marzanabad> Kelardasht> Roudbarak> Vandarbon> Tang-galou> Hesarchal> Alamkouh Peak.